Th-INK-ing of You: Christmas is just around the corner...Christmas Tree Collage! Christmas is just around the corner...Christmas Tree Collage! Hello everyone~ Happy Sunday! With Sunday comes another Stampin Sisters in Christ Challenge and today we have a real easy one!!! Our hostess this week is the sweet and lovely Linda! Linda has chosen Mark 10:27 for this week's Scripture. Linda's Challenge is Anything Goes! Now how easy is that!!! 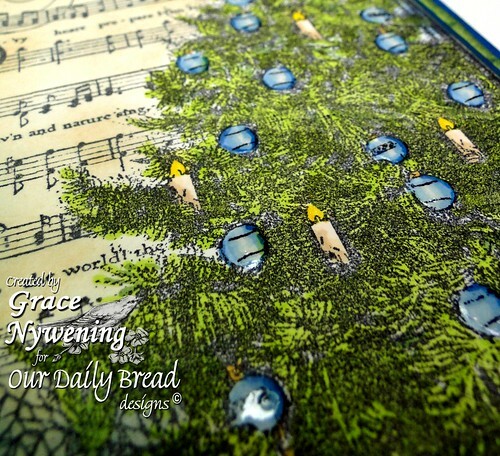 My card is made with the October release from Our Daily Bread designs called Christmas Tree Collage. It's a real fun stamp to work with... easy to color and very easy to use in a CAS card or a layered up card.... your choice! I also used the border stamp from the Porch Set. I used Memento Ink to stamp the image, then colored with Copics, adding glittery hints to the flames with a gold Spica Pen. The artwork detail in the stamp is all the shading you need! I used THoltz Distress Ink in Stormy Sky to stamp the border from the Porch Set. I sponged everything with Antique Linen, then Stormy Sky around the borders, and a little Adirondack Latte to age a bit. The base is Bazzill, also sponged. The dp is Websters Pages Botanical Christmas & Winter Fairy Tales Pack. I used Glossy Accents to gloss up the ornaments. I added a bow of seam binding, a shiny bling star, and two stick pins with beads in the two major tones of the card, and done. Very quick and easy! We want to thank them for their continued support of SSIC! Be sure to check out the Stampin Sisters in Christ Challenge for the details of the prize as well as to read Linda's devotional! This weekend, our family including our grandkids are participating in a Re-enactment of the American Revolution period at Williamsburg, VA. Sorry for the shortness of my post, but it was prescheduled. I hope to have some pictures to share when I get back! Have a blessed week and thanks so much for stopping by! Your comments mean so much to me! I love this - another stamp I have in my cart over at ODBD! Love it!!! The DP is perfect too. Hope you had a good weekend with the family! Have a great week Grace! Oh how beautiful Grace!! I just love the green and blue and how you colored the tree. The designer paper is perfect and so beautiful! Absolutely stunning my friend!! What a stunning color combo, just beautiful Grace, especially loving that ribbon and stick pens. Grace, this card is absolutely GORGEOUS! I love the rich green & rich blue combo! & your glossy ornaments are great! This is so beautiful, Grace. One of my favorite color combos again. I really like your seam binding and stick pins. What a perfect fit the star is, go Grace, heehee. Grace this is gorgeous. I love the sheet music behind the tree. I have to tell you that my eye was drawn to the tree on the left with the glowing star at the top. Blessing and hugs!!!! Oh, Grace, this is beautiful. I love green and blue together. I am really liking those new Christmas stamps. Grace this is gorgeous! I love this stamp and of course you did it up wonderfully. Lovely lovely card. Hi Grace!! You always make your cards sound so easy, but you give each one that special touch with such an artistic eye!! I love this stamp from ODBD, and the beautiful colors you chose!! I wish you a blessed week! OMGosh Grace, this is just gorgeous!!! BEAUTIFUL Grace! I just had to click through and check out the new release as I hadn't seen it yet. Seems I don't get much time for anything but the DT's I'm on and what a blessing it must be for you to be designing for such a WONDERFUL company!! I love the new releases so much I'm gonna have to splurge and get on those Christmas cards for this year!! I actually really love the door in this set too! *Ü* Have a wonderful week! This is stunning Grace! The ornaments look like you just placed them on the tree! TFS! 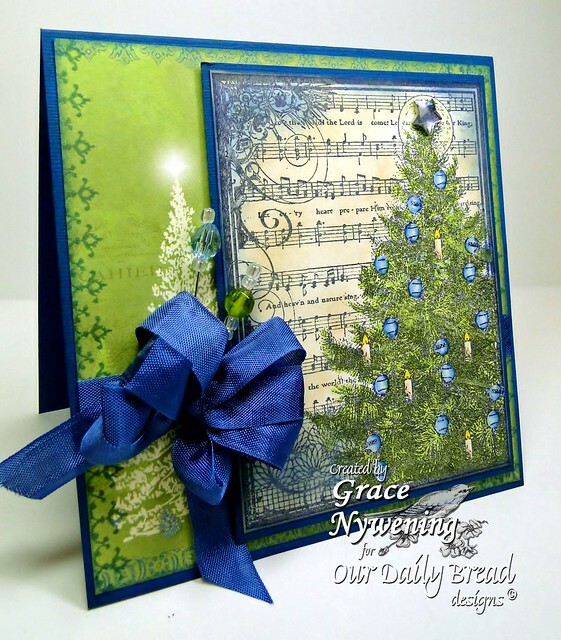 Awwwwwww Grace this is a stunner - that big stamp is a must have for quick cards!! Love how you have coloured it and made such an elegant card so simply. This is a beauitful card. There is so much to see...I really like the bow with the pins. Your color choices and coloring is so wonderful. I may actually buy some blue glass ornaments for my tree this year. I usually leave them plain...or use clear crystal. I love the dp you chose...that tree on the left is very eye-catching, also. I love the placement of the music and the flourishes...the first word I see is "Lord." Amazing card. Can't wait to hear about your weekend. I hope everyone enjoyed themselves. God Bless! Wow Grace, you sure do know how to make stamped images look incredible! I just about fell out of my chair when I saw this. I just realized that we are both from NC. How cool is that? Also, thanks for posting the Fibromyalgia ribbon on your blog. I am a sufferer. This card is beautiful, Grace! I love the blue! I love the colours and everything in the card :) Blue and green are superb.. Bow with the pins are superb.. This is so pretty Grace. I love the blue and green together. This is really a beautiful Christmas set. Great card. What a beautiful card!! The colors, the trees, the music... it is all wonderful!! Que elegante y bella esta esta tarjeta, los colores increhíbles. Te felicito por todos tus trabajos, todos pero absolutamente todos son hermosos con muchos detalles, increhíbles.